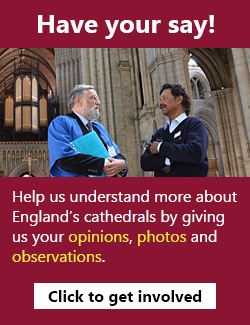 All text and image content present on this website is copyright of the Pilgrimage and England's Cathedrals project unless otherwise stated. Re-use of textual content without due reference or citation is prohibited. Re-use of images that appear on this website is also prohibited without prior permission. To obtain image re-use permission, or to submit a copyright-related enquiry, please contact pilgrimage-cathedrals [at] york.ac.uk.